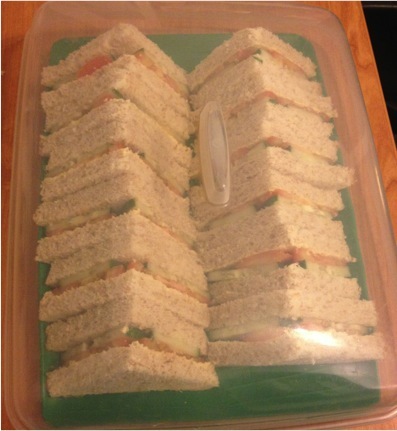 Recently at our weekly meetings, someone has been asking for vegetable sandwiches. But no eggs, no mayonnaise, no spreads. The mind boggles. How on earth do you create a reasonably tasty sandwich? Solution – taadaaa! Behold, the tomato and cucumber only sandwich! Surprisingly, it’s a very tasty sandwich! I confess to finishing whatever is leftover at the end of the meeting! And yes, I coined the phrase “Rabbit Food” …. This entry was posted on 01/11/2014 at 22:22 and is filed under Gastronomy. You can follow any responses to this entry through the RSS 2.0 feed. You can leave a response, or trackback from your own site.